John McCormick went the extra mile with his helpfulness in locating just the van I wanted, even the right color on the exterior and interior. I know this took his time and research, but he found and even arranged for the purchase and pickup of my van to be as simple as possible for us. His whole operation outside and in are well maintained and inviting. Shopping with John I always feel he is honest and helpful in answering all your questions, and if he doesn't have it on his lot he will try his best to find it for you. Give him a try first ?? I purchased a used Toyota Tundra just about a month and a half ago. What a great experience. These are the nicest most genuine people you could ever meet, let alone have as your car salesmen. McCormick, himself, was very honest and friendly. He made sure that I knew everything that was wrong with the truck (mostly cosmetic and this was ok with me). The facilities are very clean and inviting. As a first-time car-buyer he made the buying process VERY easy and even helped me save some money regarding registration. Not only did he let me drive the truck 40 miles to my own mechanic to have it checked out, but he also topped off the gas. Since my purchase I have had a coworker who also bought a Jeep and he had the same stellar experience that I had. I look forward to returning when it's time for my wife to need a new vehicle. We have been purchasing used quality vehicles from McCormick Auto Place for over 20 years! John and his staff are friendly and courteous. Their service is exceptional and we have been very satisfied with all our vehicle purchases. Whenever our family is in need of a car, truck or van, we head over to McCormick Auto Place... knowing we'll encounter a positive buying experience every time! 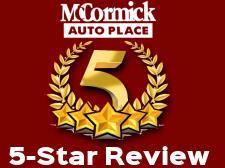 My experience at McCormick Auto Place was very pleasant and easy, and that was important to me...I like things to be simple to understand and complete. I like the dealership because it is so neat and clean; it is clearly well taken care of. My salesman, Brian, was so personable and efficient...he knew everything about the Corolla I looked at and eventually bought, and he explained it to me and answered every question I had while making me feel very important as his customer. I got a loan and the process of completing the information was simple and stress-free. I bought a 2010 Toyota Corolla and I really love driving it. I've bought cars in the past at other dealers and spent half a day or more in the process and left with a headache, so I really appreciated this experience. I had been searching with no luck to find a Silverado 2500HD standard cab long bed that was not a work truck package until I came across their listing. I called and he was quick to tell me he had the transmission rebuilt - most places would "forget" to mention that. I drove 3.5 hours from Indianapolis and if McCormick had another vehicle I wanted I would make the drive again. The parking lot, showroom, and even bathroom were spotless. He stuck a plate on the truck, checked the gas, and said turn left and drive as far as you want. When we got back he went over all the maintenance work done to the truck. Oil change, air filter, even the brake calipers had new bleeder valves. Although he wouldn't budge on the price (which i already knew) they were still asking less than what the credit union said it was worth! There's not many cars on the lot but what they have is spotless. I would highly recommend this dealership to anybody looking for an honest place to do business with. Thanks again, I absolutely love this truck.